Football season is now in full swing and with it comes the pleasant task of choosing an appropriate beer to drink while tailgating or watching the game. What could be better than choosing a beer that takes inspiration from the home team? For fans of the Ohio State Buckeyes, an obvious choice is Elevator Brewing’s Bleeding Buckeye, a tasty amber ale that comes in 16 oz cans that make it convenient for tailgating (click here to see my review of BB from last year). Another good choice would be to head over to Zauber Brewing and get a pint of Myopic Red. According to Zauber’s owner Geoff Towne this beer’s name is meant to remind us that its best not to look too closely under the hood of the behemoth that is the Buckeye football program. Chickow! with the set of Buckeye Russian nesting dolls from Moscow. In retrospect I should have opted for my voodoo doll from Haiti (preferably one in the likeness of Virginia Tech quarterback Michael Brewer). I want to touch on two points about this beer before we move onto the tasting. Firstly, what’s with the name Chickow? Does it remind anyone else of the theme song to Ferris Bueller’s Day Off (Oh Yeah, by the Swiss electronica group Yello)? That’s my best guess where the name came from and I’m sticking with it until presented with facts to the contrary. Secondly, in case you are ever tempted to home brew a nut brown ale using buckeyes in place of chestnuts, don’t do it. I learned while writing this review that buckeyes are highly toxic. According to Wikipedia, Native Americans used to crush the nuts and throw them into ponds where the toxins would leach out and still have enough potency to stun and kill the fish living in the pond. Who knew that the buckeye necklaces so popular at home games could double as your poison pill if captured by an agent of the University of Michigan. 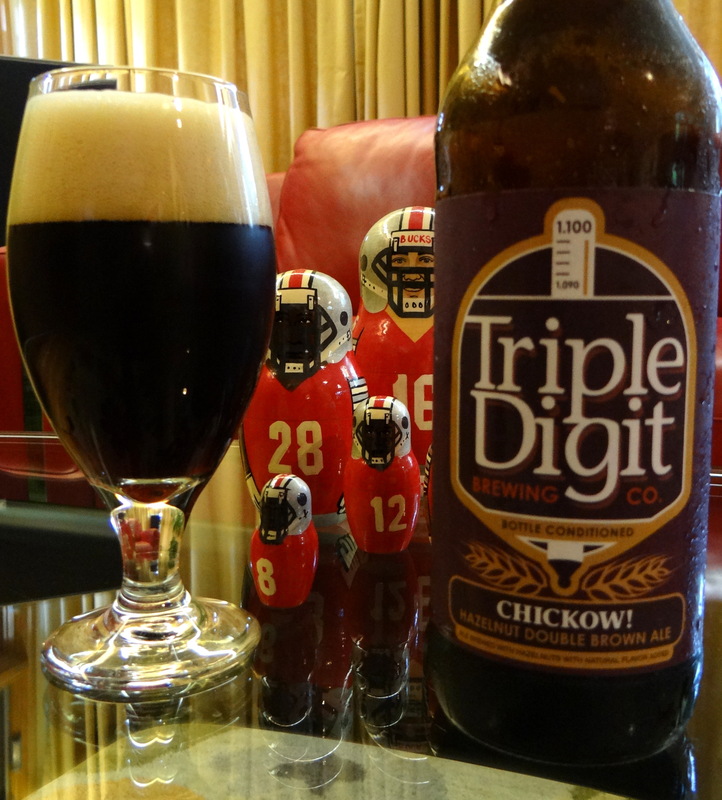 Chickow fills the glass with a dark walnut brown liquid that looks pretty opaque at first glance. Closer inspection shows that the beer is not able to absorb the long wavelength photons, as deep ruby red highlights stream through the glass when held up to a light source. A respectable 2-3 fingers of beige head forms on pouring, which eventually settles down to a few millimeters of foam that persists until the glass is empty. Turning next to my sense of smell, I’m greeted with a mixture of rich caramel and hazelnuts, with some booziness in the background. After several minutes of looking, smelling and taking notes I come to the moment of truth and go in for my first taste. Wow, this is a decadent beer! The flavors that wash over your tongue—caramel, hazelnuts, chocolate—follow the nose pretty closely, but your nose can’t do justice to the rich, calorie laden decadence that only tasting can reveal. The alcohol is well hidden and there is no hop bitterness to speak of. The mouthfeel is thick and smooth, sliding over your tongue and coating your throat on the way down. The guys at Triple Digit have taken the concept of a hazelnut brown ale (think Rogue’s Hazelnut Brown Nectar) and amped everything up, transforming it into something approaching a dessert beer. A glass of Chickow! conjures memories of Rolo candies, Nutella and Frangelico, but manages to do so without crossing the line and becoming cloying. 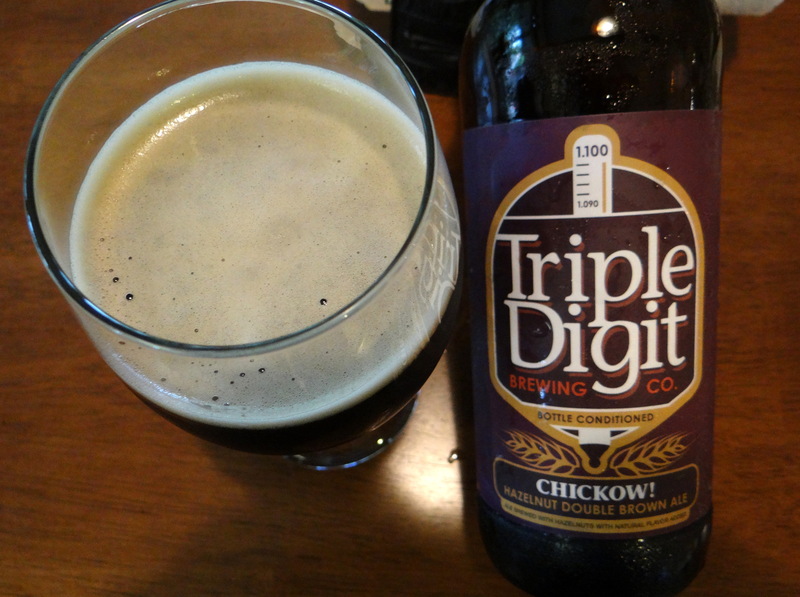 If you like rich, malty beers it will have you quoting the theme song to Ferris Bueller’s Day Off—Chk…Chka-Chickow …. Oh Yeah. I enjoyed it very much and would not hesitate to pick up another bottle next time I’m in Cincinnati. Although drinking a bottle all by yourself, as I did, is an exercise in indulgence, and at 10% abv not one to be taken lightly. Given the way the OSU-Virginia Tech football game played out later that evening, I might need a lot of Chickow! to make it through the season. I read on their website that it started out as a one off beer made only for Cincinnati’s Craft Beer Octoberfest, but the demand was so high that they made it a year round beer. I first became aware of Chickow! when reading the blog Queen City Drinks. Tom Aguero who does all the beer blogging for QCD picked his top six beers to represent Ohio and Chickow! was one of them.